For Lent this year, Central Christian Church in Moberly took on a new mission project. During the season when many give up something, the congregation was encouraged to pick up something – extra groceries for their local food bank. The idea grew out of the success the church has had with a similar endeavor over the last two Advent seasons. They have participated in a ‘reverse Advent calendar’ whereby, instead of receiving a chocolate or other treat each day, they donate a food item for someone who needs it. The church procured a list of the needed items from the local Christos Center food bank, of which Central CC was a founding congregation, and where several of their members still serve as volunteers. The twelve staple items are the foundation for each bag that the Center provides to its clients. 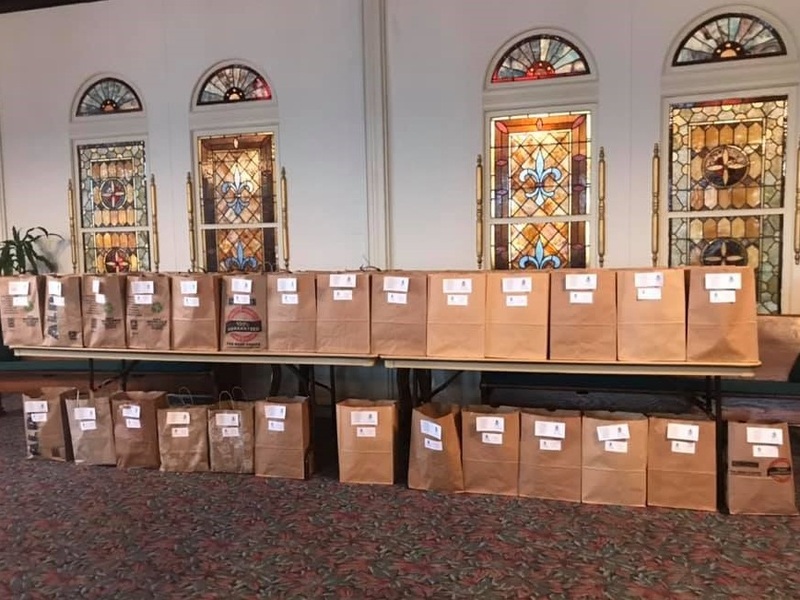 As a congregation, they were able to fill 71 bags which will be delivered to the Center for distribution after Easter! Thank you to Pastor Mark Tisch for this information and photos. First Christian Church of Edwardsville has partnered with the International Institute of St Louis to help a refugee family arriving from Afghanistan. The Mission Ministries of FCC Edwardsville have grown from regular financial support of denominational and local opportunities. A few years ago, the congregation felt called to seek larger opportunities to serve. 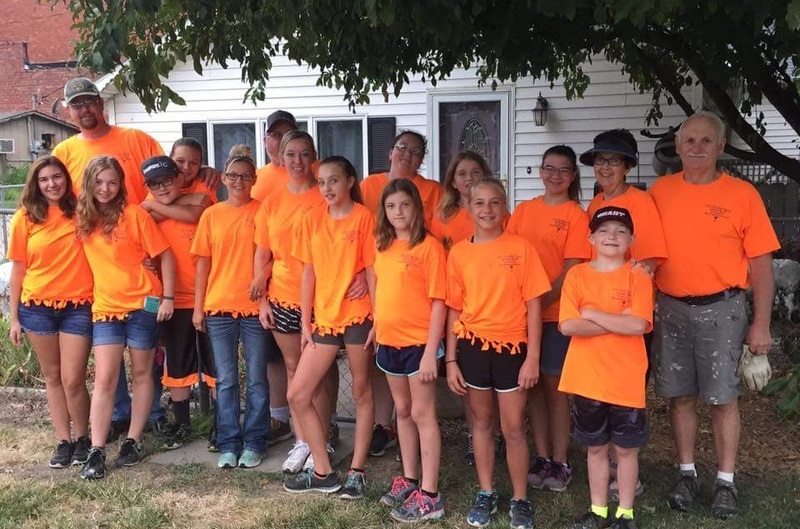 Part of the motivation was seeing the impact of mission trips on the church youth group. A hallway conversation between Barb Small (church member) and Dr. Brooks (Lead Minister) led to two “Remodeling” missions at a local homeless shelter. The congregation remodeled a bedroom (new flooring, new ceiling, paint, furniture, etc) that would shelter a family of four. The next year, the kitchen of the homeless shelter was remodeled. By now the church was using a combination of budgeted funds and “over and above” donations for these projects. Kevin Paur and his family began participating in FCCE and the mission efforts. Mr. Paur had experience volunteering with International Institute. Dr. Brooks had memories of his home congregation resettling two families of Vietnam Boat Refugees. The US State Department contracts with the International Institute (a secular organization in St Louis) for a variety of refugee services. The International Institute brings experience and connections to provide meaningful services beyond those funded by the US State Department. Kevin Paur, Barb Small, and the Mission Team reviewed options to participate with the International Institute. It was decided that a first step would be committing to provide the contents of an apartment and groceries. Adding to the excitement, the arrival of a refugee family and their needs (such as number of family members, ages, etc) are only known with a few weeks notice. FCCE donated the contents of an apartment for four people (furniture, groceries, linens, etc). A team from the church delivered the items and set up the apartment. This team transformed a barren apartment into a welcoming home. In addition, the congregation donated funds to help with future rent, groceries, and other needs of the family. Tracy Wetzel, Board Chair, and the Board of Directors have been passionate supporters of this effort. The missional efforts of FCCE are seen as a leading of the Holy Spirit. A faith community committed to youth & children’s ministry followed the example of the youth & children. FCCE has been able to engage well these mission opportunities because of the movement of God’s Spirit leading us beyond the walls where we worship each week. 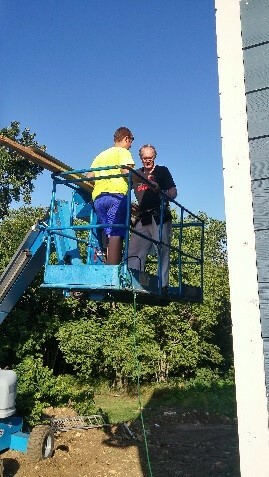 We are simply blessed with this opportunity to serve our neighbor. Montgomery City Christian Church (Disciples of Christ) has been serving their local community through a clothing and household items resale program for many years. There is a small village of dedicated women who run the mission. Volunteers meet at the church and organize donations. The women set up items around the church basement like a department store and welcome families in to browse the sections. They even arrange a Toyland in the months leading up to Christmas. People in the community have heard about Toyland and bring in donations. The women say it always feels good knowing a child will have a great experience at Christmas because of their efforts. No child should have to go without presents when there are so many at the church just waiting for a home. Visitors who are able pay $5 per bag of purchased items. The Clothing Closet also has a separate room for baby items. They partner with the local Birthright program to get these goods to families suddenly expecting a child. These families, as well as those who have had difficulties such as a house fire, pay nothing for the items they need. Besides providing toys and help for families, the Clothing Closet brings people together for the common good. What is life without fellowship and working together for Christ? Thank you to Erin Polson for this information and photo. This is the “broadest and most inclusive award” given by the Missouri Employer Support of the Guard and reserve (ESGR), which is a Department of Defense program. 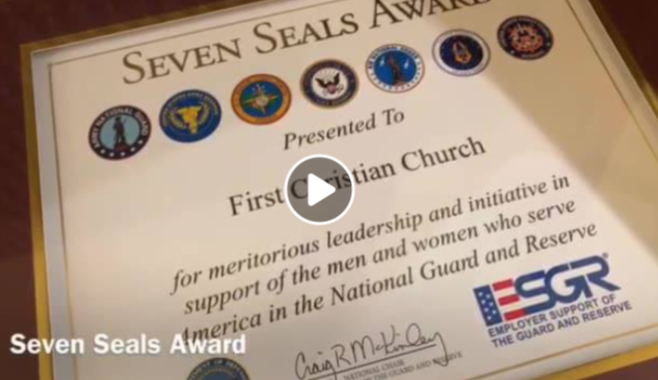 A local representative presented the award during worship on March 3. Read their full press release. A short video of the presentation is available on the church’s Facebook page. In March of 2018, the CWF of the First Christian Church in Bolivar started a new project called helping hands. They were concerned about the difficulties that survivors of domestic abuse and their children, as well as teenagers who were aging out of the foster care system, would have in setting up a home. For someone who is literally starting with nothing, the financial challenges are many: rent, groceries, utilities, gas, insurance, and household supplies. The CWF decided to help with the cost of outfitting a home by setting up a room in the church with donated essentials: pots and pans, silverware and knives, Tupperware and bakeware, bed linens and towels, small appliances and home decor items, as well as plates, cups, and bowls. Working closely with the House of Hope center for women who are the survivors of domestic abuse, the CWF invites the ladies who are leaving the shelter and setting up their new homes to choose whatever items they need. In addition, a monthly project involves the church members donating new items for the House of Hope. These include pillows, paper products, blankets and throws, hats, gloves, and coats for the children who are cared for in the facility. Laundry baskets filled with new crayons and coloring books for all ages are the requested donation for March. So far, over $600 in new items has been donated by the church, resulting in another $600 in matching funds for the charity. The CWF ladies met in March to make journals for the women who enter House of Hope. They are encouraged to reflect on their past experiences, current situation, and future goals and record their thoughts in the journal. 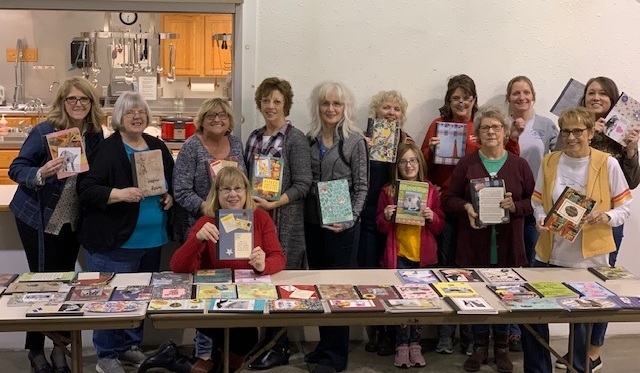 A social time of homemade soup and bread was followed by decorating the journals with inspirational quotations, scrapbooking paper, ribbons, and other embellishments. They made over 100 journals for the mothers and teenage girls who live at the several shelters operated by House of Hope. In addition, this spring they will reach out to the foster care population through the Division of Family Services and ask that they and their social worker take anything they might need for a new life on their own as they leave foster care at age 18. Thanks very much to FCC’s Barb Jones and Pastor Bill Nichols for this story and photos. 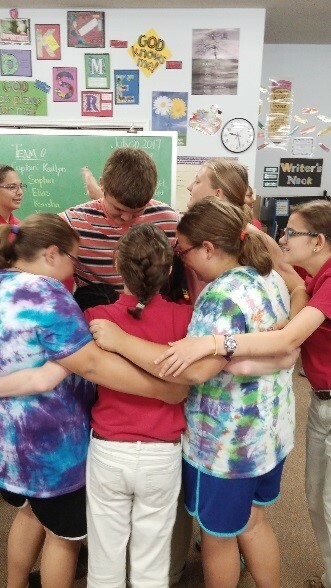 Our youth mission team has been hard at work serving others and serving Jesus through the love of Christ. This team was formed about eight years ago by Cindy Yocum-Reule and Pastor Paul Grant. The idea was to get the kids involved in a ministry of serving. The trip is 100 percent funded by free will donations and fundraisers held by the kids and adults in the church. In September of 2015 my husband Jared Nauman and I (Kailea Nauman) became the youth ministers of the First Christian Church Disciples of Christ in Mound City, MO. We went right to work with Cindy’s leadership and guidance to learn about fundraising and having a servant’s heart. She truly is a wonderful example of God’s love. These kids fundraise all year - eight to ten fundraisers for the year. They make dinners, host movie nights, have talent shows and skits portraying the death and resurrection of Jesus Christ. We have served in our community to raise funds, had bake sales, and hosted children’s games at the local flea market. They will clean yards and paint houses. They work hard all year to raise money to go serve somewhere they are needed, and give that money to those who need it. It truly is an inspiring thing to be a part of and watch these kids grow in their faith and love for serving, and their love for Christ. Last year they raised over $8,000.00 dollars to go to Houston, TX to help with hurricane relief. Our kids range from age 12 to 18 and we always have a handful of adults that go as well. Last year there were 15 people that went. What we are trying to do is center it more around family mission trips. We want all ages to want to go. If we could get young parents involved and have them bring their small children, we would be raising a generation of kids that have the value of serving others with the love of Christ ingrained on their heart from an early age. There are so many jobs they could help with; we just have to be willing to teach them. Our prayer is that this will pick up in the next few years. We will be taking our 8-year-old daughter and our 14-year-old daughter with us this year. We have talked about heading to Panama City for Hurricane Michael relief, but we are still praying and fundraising. Our church would be willing to give us the funds to go on the mission trip, but we want the kids to see what the value of hard work is and when you are serving and someone thanks you for what you did, these kids know they truly had a part in raising that money and they did it for a good cause. It allows them to feel like they truly did make a difference and that is what keeps them coming back every year. The mission work we do is truly a blessing to us as well as to those we serve. It is humbling and beautiful to be a part of. This year my husband and I will be leading the mission team and it is not without help and guidance from the wonderful church ladies that have for the last 7 years done a wonderful job of teaching these kids and adults to serve with a heart for Jesus. Without their love and guidance, we could not and would not know where to begin. We are blessed to have them in our church family and to call them our friends as well. Our Disciples National Benevolent Association (NBA) awarded a 2019 grant to the three-year-old Older Adult Ministries program in our Region. The proposal was sponsored by the Lake Ozark Christian Church. The grant allows us to expand the program to reach many more congregations. Congregations are invited to participate. The cost to the host church is just $150 total, and participants attend free. The Older Adult Ministries program has already worked with over 20 congregations in our Region, to raise awareness about aging, address biblical perspectives and explore new ministry models for the elderly. The project offers a three-phase process of exploring older adults’ physical and spiritual needs and wishes; and assessing the congregations’ priorities in developing new ministry programs for older adults. To register, contact the church or click here. 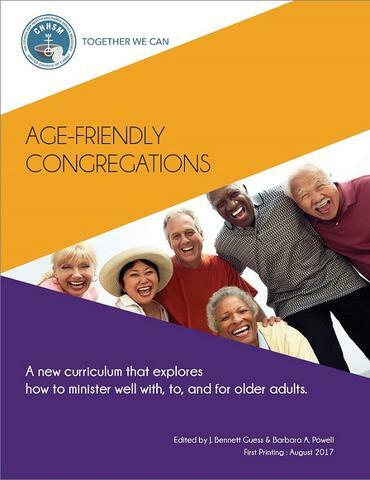 Congregations who participate will receive the newly published resource, “Age-Friendly Congregations” co-authored by Jan Aerie. This resource is free, thanks to the NBA grant. Jan Aerie, family counselor and gerontologist, is coordinating the ministry grant. She has written and led numerous workshops and programs for faith groups and secular service organizations in many states. Churches who wish to participate as a host church are being invited to apply by contacting Regional Minister, Rev. Dr. Paul Koch at 636-221-7065 or paul.ccma@sbcglobal.net. Thanks to Jan Aerie for this story. Last month First Christian Church in Mexico started what will be one of 6 mission interviews throughout 2019. We have six agencies in Mexico that I am interviewing during the sermon time. This past Sunday We interviewed Angel Wings Clothing Closet. Angel wings provide clothing for foster families at no cost. Jody Dishman runs the agency and she shared her story and how Angel Wings Works. At the end of the service we had several people sign up wanting to to attend a meeting to find out more about how our church can help. The following are the questions we are asking each agency. What is your Title? What Do you Do? · How does the process work? · Can you explain your call to do what you do? · Blessings you have received AND been part of? · If we give your group money what happens with it? · How can we help in ways that do not involve money? What are more Hands on things you need help with? 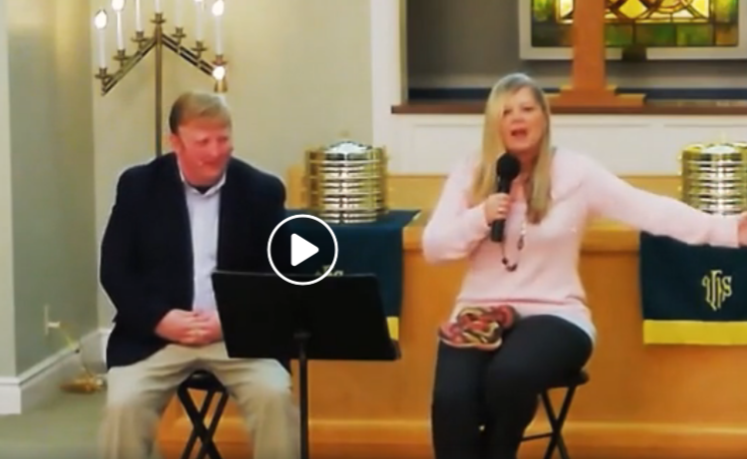 To see Pastor Zane’s whole interview with Jody, please view the service recording on their Facebook page. The interview itself begins at about the 26 minute mark. Thank you to Rev. Zane Whorton for this story. Ladies from Community Christian Church in Manchester gathered Saturday, January 26 to cut and tie fleece blankets for Project Linus. Each blanket is generally made with 1 ½ to 2 yard pieces of coordinating fleece. This service project began in January, 2011, when the ladies made nearly 40 blankets. The project, held in January of each year, has resulted in nearly 300 blankets being made. Most of the blankets received by Project Linus go to St. Louis area hospitals. We hope they bring peace and comfort to those who receive them. for this information and photos. 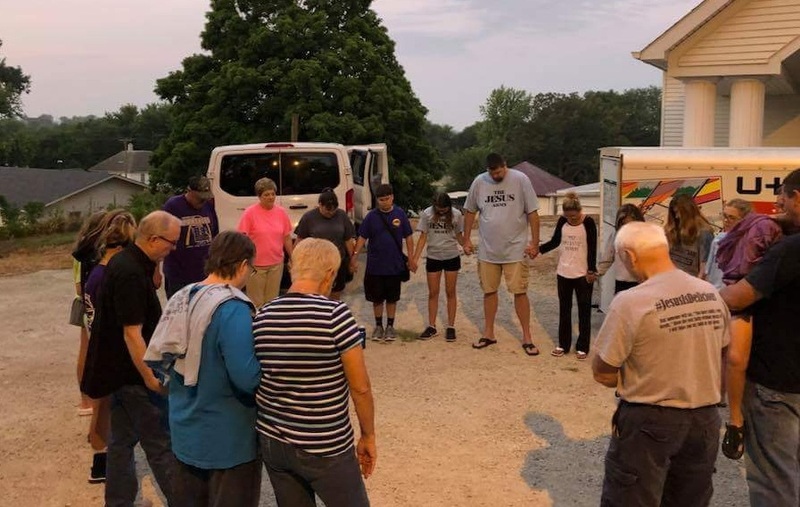 In the summer of 2017 a local Springfield congregation, Grace United Methodist Church, began looking for partners to help meet critical needs of friends and neighbors who were street-dependent. A local organization that had once served our friends and neighbors who are under resourced was no longer running, and the church realized there was an opportunity to serve the Springfield community. After some conversation with neighborhood churches, one National Avenue Christian Church member, Susan Wheeler learned that Grace was serving meals for the community on Wednesday nights. NACC, along with other organizations in the community were looking to do the same thing Grace was already doing in their space, and after gauging interest from community partners, the meal offerings were expanded to three nights per week, with National Avenue Christian Church committing to feeding folks every Monday night. One of the first questions NACC Justice Collaborative asks before beginning any project is: How is this project supporting long-term efforts to alleviate needs and create a systemic change? Several members of NACC were a part of serving meals at the now-defunct Bill’s Place on a weekly basis. They discovered that showing up for neighbors who are street dependent on a regular basis was one of the ways they felt they were following the way of Jesus. By setting the table and creating a space for people to come together, something incredible happened. At the table, people had the opportunity to get to know one another. The community at NACC was extremely responsive and excited to have an opportunity to work with other congregations and prepare the table on a weekly basis. This past Advent season, Susan noticed that Christmas Eve fell on a Monday, which gave her another idea: What if we invited the congregation to collect gift bags for our friends? What if we collected the most practical things we know our friends need and give those gifts this year? For the entire month of December, the congregation brought socks, foot powder, band-aids, chocolate, and more. One member asked her Order of Eagles group to offer financial support to be sure we would have more than enough bags for each friend who would be with us on Christmas Eve. The Sunday before Christmas Eve, the children came together to help package 115 gift bags. There are still several systemic issues to address as we consider what contributes to food insecurity and homelessness. But by being at the table and developing relationships with our friends and neighbors, we are better equipped to do this work together. It builds bridges and creates community, one meal at a time. Kevin Cravens-Koch for this story and photo. Eleven members of the Disciples on Campus college group (a joint effort between Broadway Christian Church and First Christian Church in Columbia) ventured east on I-70 last week to serve God’s people in St. Louis, January 1-5. The Urban Mission Inn at Union Avenue Christian Church served as home base for the group and allowed for fun nights of games and prayer throughout the trip. All of the mission work was done for Isaiah 58 Ministries, a non-profit agency that serves the needs of low-income individuals in the South St. Louis area and is based out of Compton Heights Christian Church. 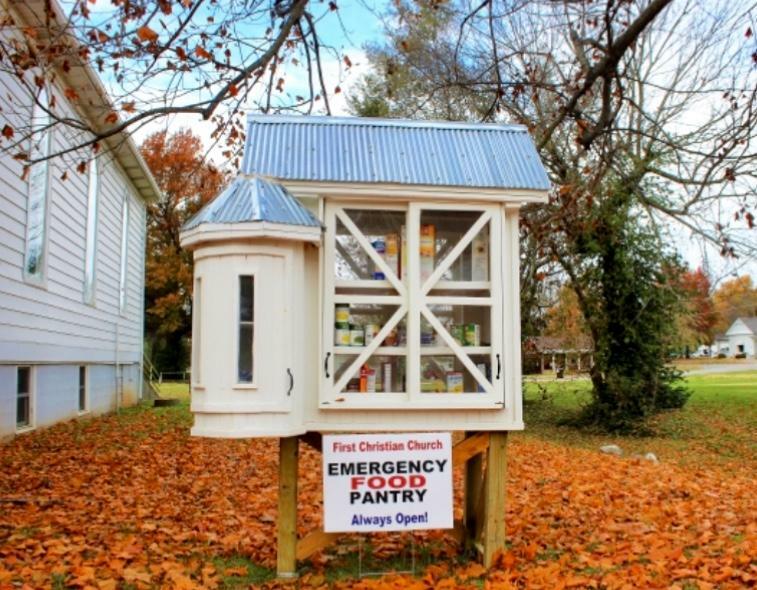 One of their largest services is a food pantry that provides healthy and fresh foods to members of the community. During the mornings, DOC organized food donations that had accumulated throughout the holiday season into boxes that could be stored until needed and participated in the fresh Friday food distribution which served more than 50 individuals. 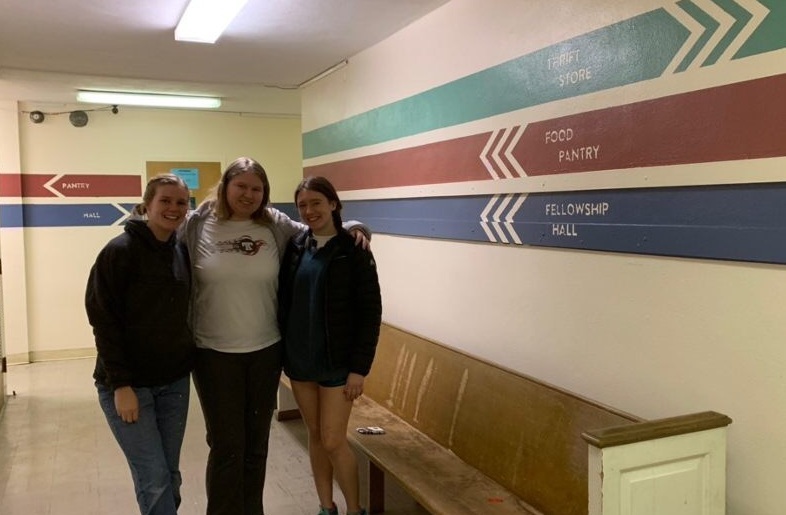 In the afternoons, we took on a difficult task of repainting the hallway into a more user-friendly system that included stripes to direct customers to the Food Pantry, Fellowship Hall and the Thrift Store. As always, the evenings were filled with cooking dinner, playing games and hanging out as a group. They had a great time catching up on their college experiences and recounting fun memories from previous trips and camp. All of the projects were completed by the end of the day Friday, so Saturday morning we slept in and went to tour the gorgeous Cathedral Basilica of Saint Louis. By going on a trip during the first week of 2019, the group felt we were taking on the New Year with a fresh sense of gratitude and faith. 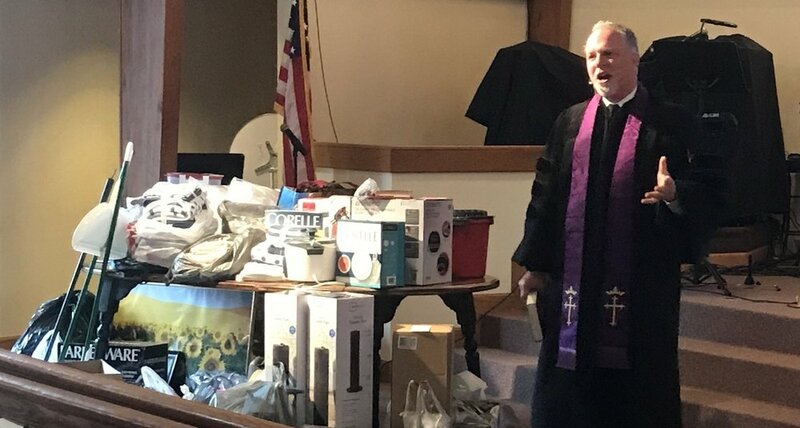 During the month of December, First Christian Church in Kennett held a drive for blankets and small heaters in partnership with Hope International. The items were delivered weekly to the organization with a total value over $700. These items are being shared with local households to provide a small bit of comfort and warmth during these winter temperatures. When Melody Wilson of First Christian Church in Windsor read in their local newspaper last summer that anybody through age 18 could stop by the school at lunch time during the summer school weeks and receive a free meal, she knew that that was a great service to many who needed such assistance. She also realized, however, that others were hungry and that they all needed help beyond when summer school was in session. Soon the foursome of Melody, her husband Lynn, and pastor David Mills and his wife Deb got in touch with the school superintendent and with the congregation about launching a program to feed hungry people. Volunteers stepped up and members banded together to serve a total of 419 lunches over the Tuesdays and Fridays of the seven-week period last summer. Of course those thirty people (on average) who were served on Tuesdays and Fridays need lunch on the other days as well. For next summer, the plan is to extend the program to serve lunch at the church every weekday. With the support of the local Ministerial Alliance, other congregations are getting involved and providing food and staff for the other days of the week. This program now represents an official subcommittee of the church Outreach team and is making a big difference in this community! photos, and this wonderful ministry! On one December Saturday every year, Abbey Road Christian Church turns its welcoming hall and sanctuary into an international crafts market. The Cape Girardeau congregation partners with Plowsharing Crafts to share the stories and sell the handicrafts of artisans in over 40 countries, providing them with fair trade income that helps pay for food, education, health care, and housing. The sale is promoted with yard signs, social media, and old-fashioned button-holing of friends. A caravan of SUVs goes to Plowsharing Crafts’s brick-and-mortar store in St. Louis to load up with goods. Meanwhile, at the church, other members prepare racks and display tables. “It’s exciting to see a vibrant slice of the world in our sanctuary,” says the congregation’s interim minister Rev. Doug Job. This year’s will be ARCC’s seventh annual sale, so Cape holiday shoppers have come to look forward to it. Between six and eight thousand dollars have been raised with each market. Saturday, December 8, from 8 am to 1 pm, the Plowsharing Crafts International Fair Trade Market will be open at 2411 Abbey Road, Cape Girardeau MO 63701. Please come “buy” if you’re in Cape! Thanks to Rev. Doug Job for this information and photos. Note: South Joplin CC will also be holding an Alternative Gift Fair Nov. 30-Dec. 2. The Christian Regional Youth leadership team met in Marshall this past weekend. They spent Saturday evening in leadership development training and meetings, preparing for a brand-new winter event. After a few hours of rest, several members of the team remained to join Marshall First Christian Church in their semi-annual S.O.S. Sunday. A brief worship service takes place prior to church members conducting Service Outside the Sanctuary, doing construction, yard work, household maintenance, and delivering home cooked meals to the home bound. Although it was cold and rainy, it didn't stop the team from raking leaves and cleaning up an overgrown yard! The regional youth team are excited to announce WINTER FEST, a weekend winter retreat for high school-aged youth on January 19-21st in Fulton, MO. Watch the Regional website for a flyer and registration information, coming soon. 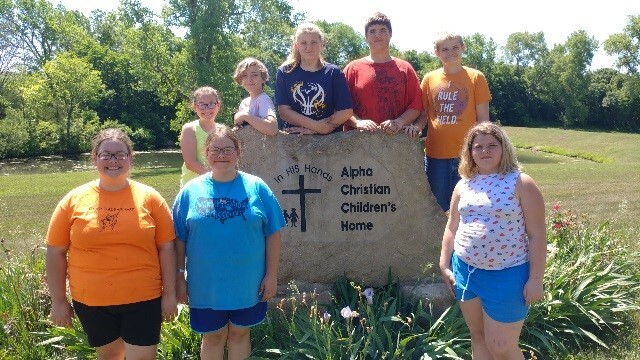 For the past two years, a small group of the youth ministry mission team from First Christian Church in Maryville have traveled down to Perry, KS for two different week long service missions at the Alpha Christian Children’s Home. Alpha is a ministry that houses children in need and provides them an education on campus as well during their time at Alpha. Alpha is 100% privately funded and relies on the donations of churches and volunteer labor to keep the 170-acre property going for the children and staff who reside there. Our first summer visit was in July of 2017. Our team worked side by side with the VIM (Volunteers in Mission) to help rebuild the main staff house (it will also serve as respite care for the children) which had been destroyed in a fire from a lightning strike a couple of years prior to our visit. Our children were taught how to hang cement board siding, install windows and doors, put in flooring and walls, and run a variety of power tools necessary for the jobs. While there, we had the opportunity to share meals and games with the children and families of Alpha, as well as prayer for and with the mission director each night during devotion. Prior to our trip, the youth had also collected a van load of food and supplies donated from our church family and matched by the youth mission team. Over 100 items and $400 was given to Alpha as a result of their donation drive. This was the beginning of a beautiful relationship and a life-long love for the ministry being provided at Alpha. Our second trip out was this past summer of 2018. This time we worked on gutting a few rooms in a house recently being renovated on the property for one of the school staff members. 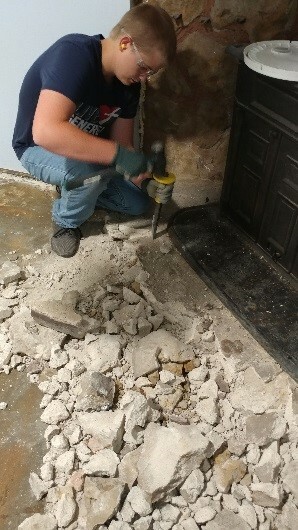 The mission team tore out an old fireplace, the bathroom, and flooring during the afternoon. The mornings were spent clearing out areas around the house outside. As part of the clearing job, the team took down play equipment and moved it near the school house. They also disassembled a goat pin and then reassembled it at the main staff house as a dog pin. Again, we got the opportunity to share a meal and evening of water games with the families of Alpha. Prior to this trip, donations were once again gathered and a $1 per mile challenge completed allowing us to bring a large amount of supplies and over $300 to donate. During the month of September the church family of Clinton Christian Church opened their hearts and their wallets and donated many needed items to the local animal shelter, Clinton Animal Rescue. Here in Clinton our pets are part of our family and we have big hearts for animals at the shelter. The items donated were : 190 pounds of dog food; 206 pounds of cat food; 11 bottles of laundry detergent; 5 bottles of unscented bleach; 3 boxes of dog treats; 8 feeding bowls; 10 leashes, and 2 dog toys. These items were presented to volunteers of the animal shelter at our annual Fall Fling Flea Market held in our parking lot on October 13th. We also donate a booth space to the animal shelter at our flea markets so they can show off some of their animals that are up for adoption. In the picture are two members of our Church in Society committee (the committee in charge of the outreach project), three volunteers from the animal shelter, and 2 of the dogs that are up for adoption. We have a Spring Fling Flea Market on the Saturday of Memorial Day Weekend and our Fall Fling Flea Market some Saturday in early October. We sell booth spaces for $20 and the money raised goes to the membership committee for any outreach they want to do. Our CWF group has a concession stand at the flea market (biscuits and gravy and cinnamon rolls for breakfast, hamburgers and hot dogs for lunch) to raise money for any outreach project they want to pursue. The flea market has been well received by the community. This past one we had 28 outside (the church) vendors participate. We will also have church members bring items to sell and the church has a booth; usually those monies go toward our youth program. We have been doing this for 3 years now. The Church in Society Committee (CIS) has an outreach project most every month. We collected school supplies for Festival of Sharing and sent 72 school supply bags to Tipton. This month we are collecting 950 boxes of cake mix for the Samaritan Center, our local food pantry, for their Christmas Cheer project. CIS is also hosting a Trivia Night on Friday, October 26th to raise funds to help buy books for the Clinton Elementary School kids. Last year we raised $1000 for this project with Trivia Night. Thank you to Pastor Tim Wessley for this information and photo. The Rickman Legacy Leadership Grant is funding the second year of Older Adult Ministry training programs across our Region. Eighteen people representing seven congregations gathered at Millersburg CC in Fulton on September 30 to explore and discover biblical perspectives on aging, ways to manage change and loss, and to explore older adult ministry models. Bible passages and personal stories uncovered some ways our stereotypes about old age can limit our perspectives. We looked at the big picture and some of the details about changes in our outlook and abilities. Through a devotional and discussion mode, we reinforced our hopes and wishes for growing older with a focus on God and an attitude of flexibility. Affirming that we are all interdependent, we discussed how our congregations might recognize, develop, and cultivate programs especially for intergenerational groups or specifically for older adults. There is a final event this year in Mt. Vernon on October 27 from 9am to 1pm. The session is free but registration is required. For more information, contact Paul Koch paul.ccma@sbcglobal.net or Jan Aerie aeriej@gmail.com. Thanks for Jan Aerie for this information.